Over the summer, Meredith Ethington of Perfection Pending shared a list of the anxieties that plague her – and moms in general – every day, like having enough food in the house, cleaning messes, making it to appointments on time, etc. I stumbled across “Thoughts Moms Have After A Long Day of Work” again recently, and have some thoughts of my own. The punch line to her post is that dads aren’t troubled by such things, and only think about naps. It’s all in good fun -in the comments she included a disclaimer that her husband is great and that the list was merely meant to showcase “the mental load” women have that men often don’t – but she’s not alone. The idea that moms are the only ones who deal with this kind of anxiety is pretty common. I beg to differ. This place is a dump, why didn’t my woman clean the house? Keep these children away from me. I love guns. LOVE ‘EM! Where’s my woman with my dinner? I need to set my fantasy line-up. Somebody shut these kids up, I’m trying to watch the game. Obviously, I kid. (Actually, maybe it’s not obvious…) But assuming that moms are alone in having anxiety over the state of their households and the well-being of their families does dads a disservice. We have concerns too! I’ve written about about some of the things that bring me anxiety and they’re largely the same things that bring every parent anxiety: money, health, our kids, fantasy football. You know, the major stuff! No, I don’t spend a lot of time worrying about sunscreen or cat food or watering flowers (partially because we don’t have a cat or flowers – sorry, honey!) but also because my wife and I have a division of labor. 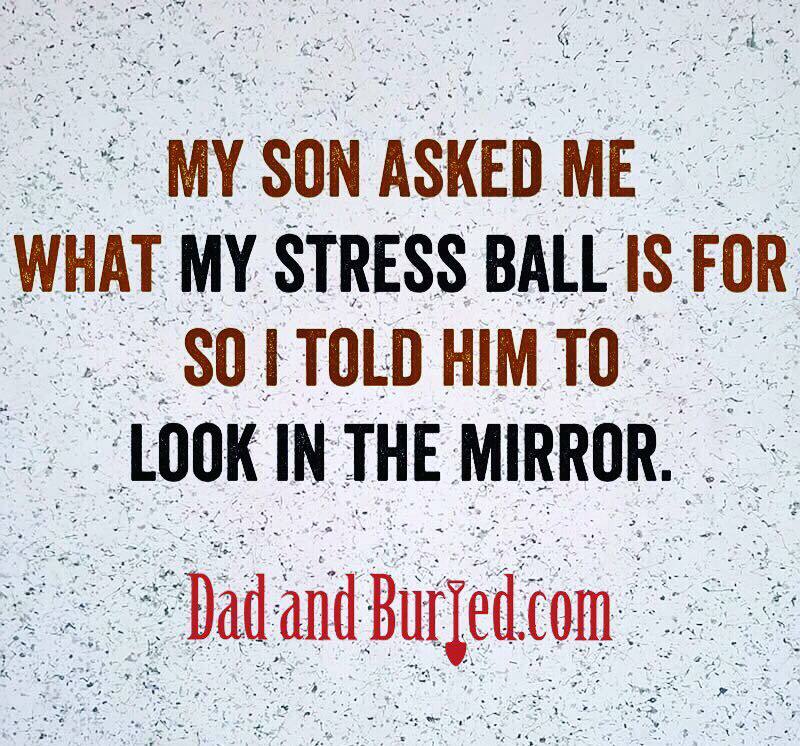 When I was a stay at home dad, I was responsible for grocery shopping and bug spray and making it to the car pick-up line in time, and Mom and Buried was the one dealing with clients and bosses and getting approvals on artwork and scheduling conference calls. Nowadays, I go to an office five times a week, where I worry about PowerPoint and Word docs and deadlines and bosses. I could make a list about all of that stuff and shove it in my wife’s face, but what’s the point of that? Keeping the house spotless may not be at the top of my to-dos, but that doesn’t mean I’m not aware of or don’t value my wife’s efforts. In my experience, my wife likes to get her mental load off her chest by vocalizing them (usually right when my head is hitting the pillow), while I prefer to keep mine contained, acknowledging them only when it’s absolutely necessary. Often, as a result of one of Mom and Buried’s patented middle-of-the-night mental dumps, she’ll suddenly be light as a feather, asleep in no time, whereas I’m left wide-awake, plagued with the litany of tasks and tensions she just dropped on me. I prefer to keep mine buried while I attempt to resolve them. Does my way work? Of course not. Does my wife’s? How should I know, I’m not from Venus. All that said, I know where Meredith’s list is coming from. In fact, I’m quite certain my wife agrees that moms have a bigger mental load! I haven’t asked her yet, but I’m sure she’ll let me know just as soon as I shut my eyes.